We gathered up the dead pine needles into a thick square onto the hard baked earth. The needles pricked my fingers and sent clouds of dust into my nose causing an avalanche of sneezes. There were sharp stones, large boulders, tree roots and suspicious looking tissues dotted around the forest floor. We cleared a space as best we could and placed the groundsheet onto the pine needles, attempting to correct a 15° slope by the addition of further needles and creating an echo avalanche of sneezes. By the time the fly sheet was on and the tent pegs were being hammered into the earth, we were both covered in dust and I had the equivalent of a bad head cold. Hmm, the benefits of fresh air and ‘back to nature’ pursuits. 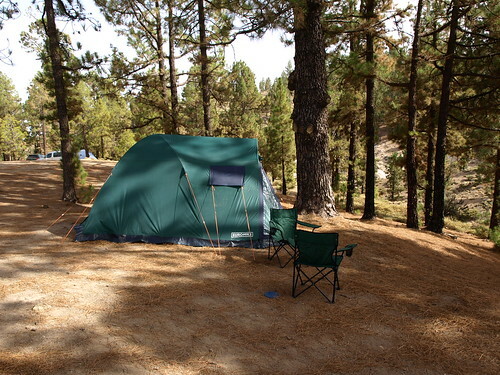 We’d decided on a hike to Paisajes Lunar near Vilaflor and needed an early start so it was the perfect excuse to enjoy a Tenerife drive up into the pine forests around Teide National Park and try out one of the free campsites that Tenerife has to offer. Further along the ‘zona de acampada’ or camping area, were two small and one medium sized tent occupied by five boys and two men; presumably a ‘boys and dads’ camping weekend. Other than that, the zone was empty. It was difficult to see what had determined this area as the camping zone. The ground was exactly the same hard, uneven, stone strewn pine forest as the rest of the park and there were no facilities of any kind. The only reason we had chosen our spot was because the car couldn’t go any further on the jagged terrain and the ground disappeared on either side into steep barrancos. The amount of space where it was actually possible to pitch a tent at all was minimal and the only nod to the needs of campers was the proximity of the toilet block which, on closer inspection, turned out to be a hole in the ground with a flush pipe and a sink with no water. That explained the tissues. When the tent was pitched and the guy ropes taut, we cracked a couple of beers and sat in quiet (apart from my sneezing) contemplation of the warm solitude of the pine forest. Three more sets of campers arrived before dusk and there was a flurry of activity as tents were pitched, suppers were prepared and eaten and lamps were lit as the darkness crept like a silent thief amongst us and stole every last vestige of light. This is Teide National Park, over 2000 metres above sea level in an area of forbidden light pollution; when darkness comes, it’s complete. Little by little stars began to appear above us and instinctively, one by one, we extinguished our lamps and torches until there was nothing but the night’s canvas to fill our vision. Familiar constellations like the plough and Orion were lost in the multitude of tiny lights that penetrated the black. As our eyes adjusted to the darkness, more and more stars appeared until it seemed like the entire sky was one vast Milky Way intermittently slashed with the fiery trails of shooting stars which appeared, streaked and faded before I could even raise a finger to pinpoint their location. By the time we came back from our hike the following day, all the other campers had packed up and left, leaving the forest and the star studded cosmos to just us; the last two people on earth. Which of the following statements would you say was false? “The answer is d)!” I hear you cry. Wrong. The answer is that all of the above are true. And whilst the story of how we met Chris and Kath Shaw in the National Park is, in itself an amusing story of illusion, its moral is clear: don’t underestimate the power of networking…wherever you are. The “couple who passed me at speed” in the story turned out to be the proprietors of a successful, UK based PR Agency called Pink Elephant and, once they’d got over their confusion as to how we’d managed to materialise on the path ahead of them, we exchanged website addresses (the modern equivalent of telephone numbers) and promised to stay in touch. When they made one of their rare holiday visits back to Tenerife we met up with them for dinner at Cha Paula’s in Puerto and chatted about our respective businesses. Thanks to Pink Elephant, this week’s Wednesday edition of the Manchester Evening News carried a ¾ page spread on Real Tenerife Island Drives, Jack and myself and an article by Leslie Beeson of Tenerife Property Shop on the continuing good sense of investing in Tenerife property in the prevailing UK downturn. Whilst we haven’t actually seen the page ourselves (there’s a copy winging its way to us from the UK as I speak), we have already been contacted by several friends and former colleagues in the UK all quoting pieces of it back to us and taking the mickey out of my “former pupil of Stockport Convent High School” reference (I can’t think why that should be so amusing) and Jack’s “raised in Rothesay, Isle of Bute” pedigree and generally enthusing about the article. While we wait with baited breath to assess the economic impact of the piece, it’s certainly got people talking about us, which is rather splendid. If you’d like to benefit from seeing Pink Elephants, get in touch with Chris and Kath, or keep an eye out for them when you’re hiking in the crater! Horror movies are really not my thing so I wasn’t all that enthusiastic until Jack explained that the Lions Club were making an actual giant paella as part of the Puerto July Fiestas and that perhaps we should pop along and witness the creation. We left at midday in the firm expectation that we’d be parked and down at the harbour by 12.15 (ish). But having queued for 20 minutes to find that the town’s main car park was closed (of course no signs until you actually get there when 4 Policia Local are manning a 2 foot wide barrier), queuing to get back out again, kerb crawling our way through town and finally driving all the way back up to La Paz district before we could find a parking space, it was after 1pm before we got into town. It was a glorious day and the small beach at San Telmo was packed beyond capacity for swimming and kayaking competitions (not simultaneous you understand). 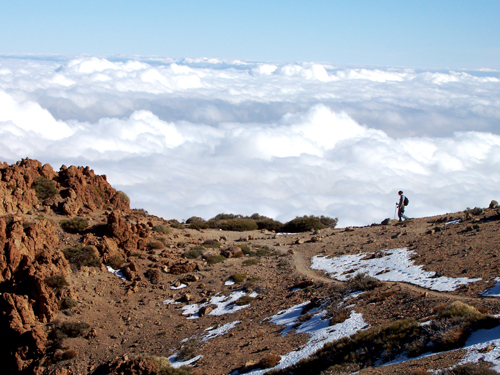 Although this is low season for Brits and Germans in Tenerife, in the north, it’s high season for Spanish mainlanders and the town was teeming with visitors. 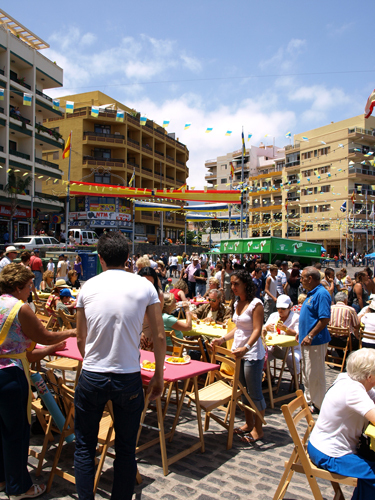 Puerto is in the midst of its July Fiestas and there’s a festival atmosphere throughout the month, particularly on Sundays. I was keeping myself amused by admiring the hordes of young, muscle bound, suntanned men (I think there were women there too) who were milling around the temporary bar, presumably having finished their competition swim and now chilling to the Indie rock sounds that were blasting forth, when my attention was caught by a silver flash in the sky. 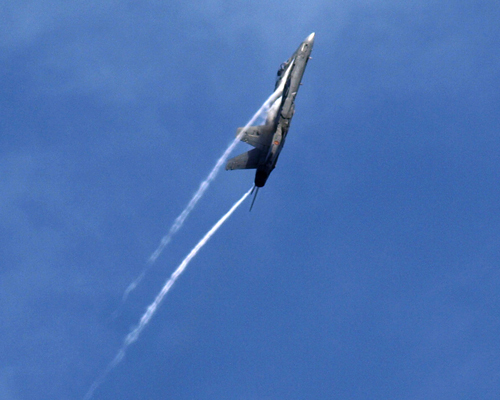 I looked up to see a fighter jet at what seemed merely feet above the San Temo rock pools, heading towards me at supersonic speed. It was eerily silent, any engine noise drowned out by the music. Just as it came parallel with the shoreline, it‘s nose went up, it began to climb, the condensation clouds spilling across its wings and the air shattered into an ear splitting roar that silenced Coldplay. I watched it bank and come back across the horizon, spinning twice and flying upside down before righting itself and once again screaming into the heavens. It was so low I could almost see the pilot. I felt a surge of adrenalin that sent my heart beat into overdrive. I have never been in such close proximity to such power and danger and I cannot imagine what sort of person would fly a fighter jet, they must be in the top one percentile of the population. “Tom Cruise” said Jack, bringing me back down to earth. By the time we reached the harbour, the prospect of a giant paella had paled into insignificance in the excitement of the air show and having long since missed its creation it was now half way to being completely consumed and not all that giant anymore. Still, it rallied a few points with its delicious aroma and bargain basement price; a plate of paella, a banana, a bread roll and a small beaker of wine for €5. Understandably, there wasn’t a spare seat to be had at the makeshift restaurant beside the fishwife. 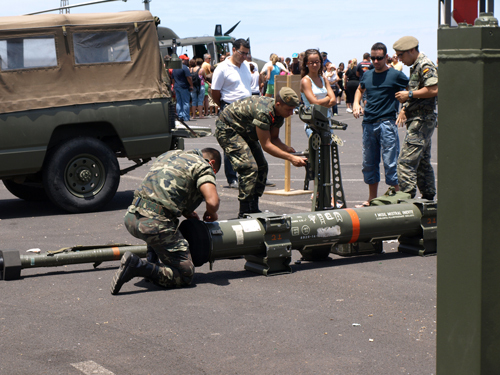 In the Parque Marítimo car park we discovered why it was closed; four helicopters and several divisions of armed forces were displaying their equipment (sooo tempted to say something very Julian Clary there). Amongst the helicopters was one belonging to M.A.R., the type used in fire fighting. I was surprised at how small the bucket that holds the water was, especially given the double blades power of the helicopter. It brought back the horror of last year’s forest fires and the difficulty of getting adequate water to the island’s interior to deal with such an ecological disaster. Small children were being placed inside the cockpit of the helicopters while their parents photographed them. I could see the machine guns mounted in the nose, rows of bullets ready to thread their way to destruction should the need arise. Given that the soldiers were Canarios and not in fact Tom Cruise, I gave the nose a very wide berth lest someone had forgotten to engage the safety lock. I’d gotten just about as close up and personal with military hardware as my nerves could stand for one day.